Having a spray treatment carried out to your grain stores will greatly reduce the likelihood of insects infesting and damaging your crops. The process is quick and effective. Please call our office to book your treatment. The treatment renders the area fit for new crops to be stored safely reducing the risk of commodities being rejected after delivery has taken place. The procedure helps protect against infestations of stored product insects such as grain weevils, grain beetles, grain borers, booklice, white shouldered house moth, and other similar insects. Our specialised equipment can project the insecticide to the highest potential harbourages penetrating any accumulated dusts and maximising the effects of the insecticide. This treatment gives several months protection. A fogging treatment can be used as a back up (details on request). A fumigation service is also available to treat any crop that is already infested. Environments where food is stored, prepared or eaten can attract pests that may end up causing contamination issues. BRC advise that the whole process of food manufacture from harvest to retail be monitored for pests and treated if required. 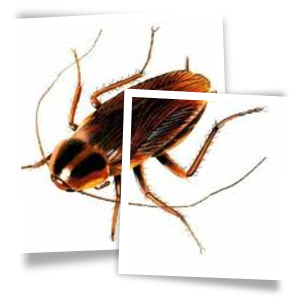 It’s also a legal requirement under due diligence to monitor and control pests to ensure that damage and contamination does not occur. There are thousands of species of insects each with their own unique biology and behaviour. Insects will readily infest stored products be it grain, flour, pulses, beans, meal or in fact any other cereal based product. Feed bins, grain stores, warehouses, factories, shops, restaurants and even houses can all become infested, a good working knowledge of these species and how to treat them is a must. We can monitor and treat most situations. 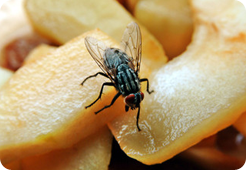 Flies are the biggest source of disease to humans, spreading dangerous pathogens from their filthy breeding sites to us. The presence of flies is both undesirable, can constitute a serious health hazard and in some cases result in breeches of legislation. Breeding sites generally consist of decomposing/fermenting organic matter i.e waste food, animal bedding / manure / slurry and even stagnated water being a few such areas, pathogens are then transferred from these areas by the adult flies. Our highly trained technicians would identify the source of such activity, advise remedial action and treat where appropriate. We can supply and if required maintain a full range of electric fly control units. Our machines are approved to European Electrical Standards and offer many innovative features combined with unrivalled reliability. Waste sites including transfer stations, biogas and other similar units require regular monitoring and fly control, it is a legal requirement that these duties are carried out. The Environment Agency monitor such sites regularly, we provide peace of mind to companies involved in such operations. We also offer fly control on poultry, pig and cattle farms in order that farmers avoid prosecution under the Clean Neighbourhoods and Environmental Act 2005. Advice can be given when applying for planning applications involving pig and poultry units if required.